The last step will not remove the shared memory segment immediately. It will mark the shared memory segment as to be deleted. If all processes are detached, the shared memory segment is deleted. 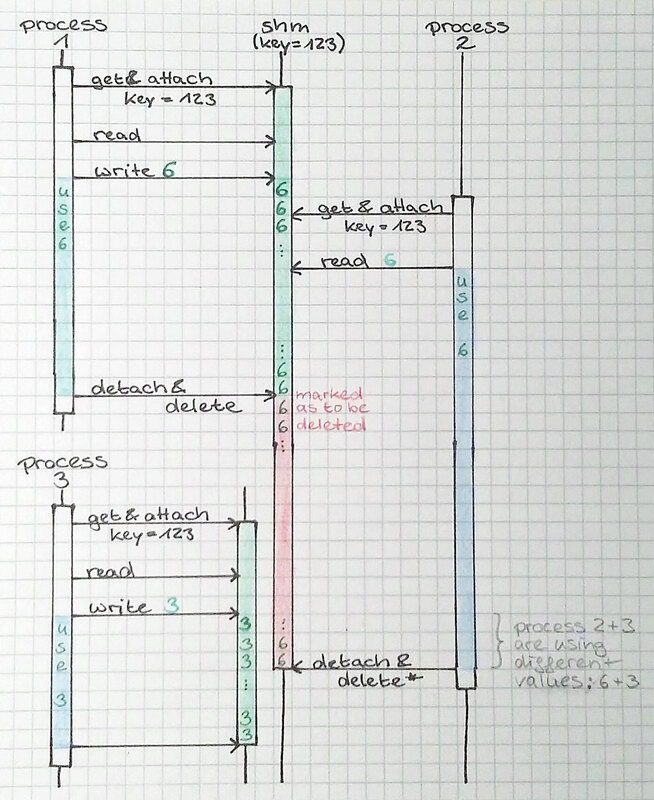 So the question is, can we can use that behaviour as is for an automatic cleanup of a shared memory segment, if we think of multiple in parallel running processes with different starting times. The answer is no, because shmget will never give you a shared memory segment, which has been marked for deletion. Instead you either will get a new one, if you use it with IPC_CREAT, or an error otherwise. You can see , that there is a time frame in which two parallel processes using different values. The 2nd process uses 6 while the 3rd process uses 3. So finally, to implement the wanted behaviour, we have to implement something around this. Either we check the number of attachments and only delete the shared memory segment, if no process is attached anymore. Then we will have a short time frame between get and delete in which new attachments could have been done. So you will need a kind of locking here. Or alternatively, we can do a shmget only if no shared memory for the key exists. In this case, if a shared memory segment already exists, we only attach to the shared memory using its id without doing a shmget before. But of course this means that we have to store the id of the shared memory segment (e.g. in a file), so that a new started process can get it.